What if you had the chance to dream up the creative to appear on some of the country’s largest out-of-home spaces, across some of the biggest cities? 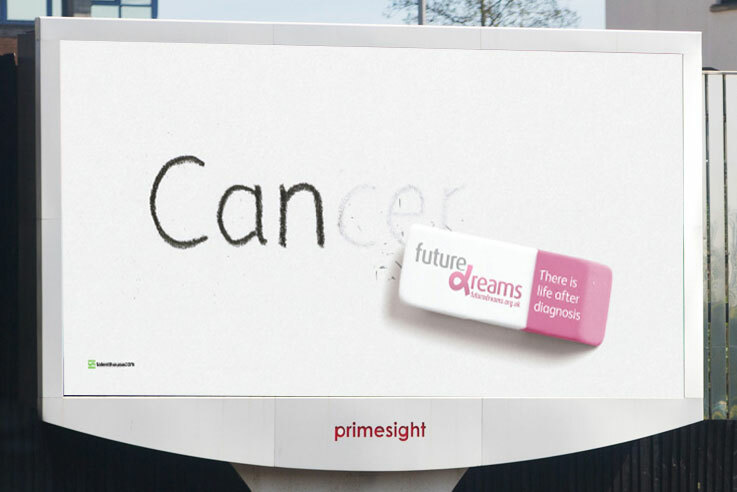 In partnership with breast-cancer charity Future Dreams, this was the opportunity Campaign, along with Primesight and creative platform Talenthouse, gave to talented minds all over the world through "The Ultimate Canvas". It’s a creative call to action, with Campaign’s global editor-in-chief, Claire Beale, judging alongside Peter Souter (chairman and chief creative officer, TBWA\London), John Treacy (executive creative director at Proximity London), Naren Patel (chief executive, Primesight) and Julia Leckey (founder of Honest, and Future Dreams’ representative). 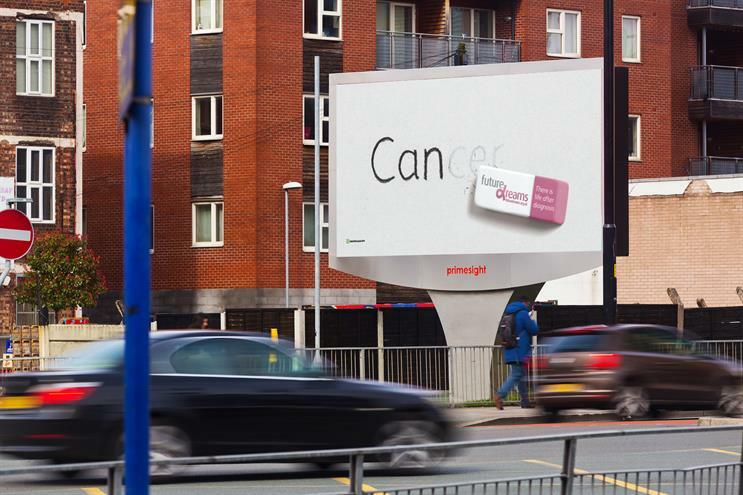 The brief was simple: raise awareness with a 48- or 96-sheet outdoor campaign that reflects the charity’s ethos of survivorship, positivity, support and life after cancer. And we were bombarded with entries. We had a huge range of submissions from more than 400 passionate designers, photographers and innovators representing the breadth of experience artists have with this emotive subject. From risk prevention ("To love yourself is to check yourself") to fighting ("No matter what you do, I’ll beat you! "), the strength of entries reflected the different realities of breast-cancer diagnosis. The chosen design will appear on £250,000 worth of outdoor ad space across the UK, with the winning artist picking up $1,000. "This entry is a visual representation of the charity’s ethos and work. [Future Dreams co-founder] Sylvie Henry believed that cancer diagnosis doesn’t erase who you are. Future Dreams has been fighting to erase breast cancer from women’s lives since 2008 with one-to-one emotional and physical support." "It’s been fantastic to see so many artists from across the creative spectrum engaged in such an important cause and focused on bringing to life the power and impact of the outdoor medium," says Claire Beale. "So many of the entries struck a real balance between simple but arresting messages, and many of them were genuinely engaging and positive. The whole competition has highlighted the potent combination of brilliant creativity and one of the most impactful media platforms," she adds. For John Treacy, there’s no room to hide when creating a poster. "You have three seconds to land your message. That’s why it’s the ultimate expression of a creative idea. Those that didn’t pass the three-second test were quickly discarded, leaving really strong ideas simply executed." Spencer Leslie, Trustee at Future Dreams, said: "As a trustee of Future Dreams our role is to continue the legacy created by our founders Sylvie Henry and Danielle Leslie. Coming from artistic backgrounds they would be thrilled and delighted by this competition and the quality of the ideas that have come forward. They wanted so much to make a difference and this competition has. We are extremely grateful to everyone who has participated and thrilled with the end result." Missed out on this first round? The second is already up and running. You have until Friday 19 August to submit your work and help raise awareness of the next charity, FAB, which provides UK activity holidays for bereaved military families. The chosen design will feature both in Campaign and, of course, on whopping big outdoor ads. Visit talenthouse.com and search for "The Ultimate Canvas".